This only appears to happen in my work machine where i have Visual Studio installed an open most of the time, both machines are running windows 10 and both are connected via wired Ethernet. I have my laptop next to me on my desk that is the client to my work computer. It often happens that when i go to click something on the laptop, the click does not register. The mouse will move and if i hover over a program in the task bar i can see the app snapshot pop up but clicking does nothing. If i then move my mouse back over to the server side and click in an application i have open (not Visual studio) or just the desktop and then go back, the click is working again. Hi @James Fee. Please provide more details for your machines (OS version, 32/64 bit, Synergy version installed). I'm having this same issue ... this usually happens 3 or 4 times a day to me ... and is becoming quite frustrating. The workaround to fix this is I have to move the mouse cursor anywhere on the Synergy Server PC screen and click the mouse (like on the desktop background ... anywhere really). Subsequently mouse clicks begin to work again on my two client computers (I haven't confirmed this also happens on my Mac yet ... I don't use the Mac very much). In my configuration I'm using latest Synergy stable 1.8.8-stable-c30301e, 3 PCs, all Windows 10 Creators Edition 64 bit, and one Mac mini. One of the Windows 10 PCs is the Synergy Server. Also configured with SSL on. I've been using Synergy daily for like 10 years. This issue has crept up in the last release (or two) of Synergy. ...and it just happened again. I submitted the above post, which went OK. Then I paused for a minute or two (no keyboard nor mouse movement). Then I went to close the tab in my browser to close this forum, and I could not click the tab closed ... mouse clicks anywhere on this PC were disabled. Like reported above, I had to click somewhere on the server screen after which I was able move cursor back to this PCs screen to make this reply (because mouse clicks were being handled again). 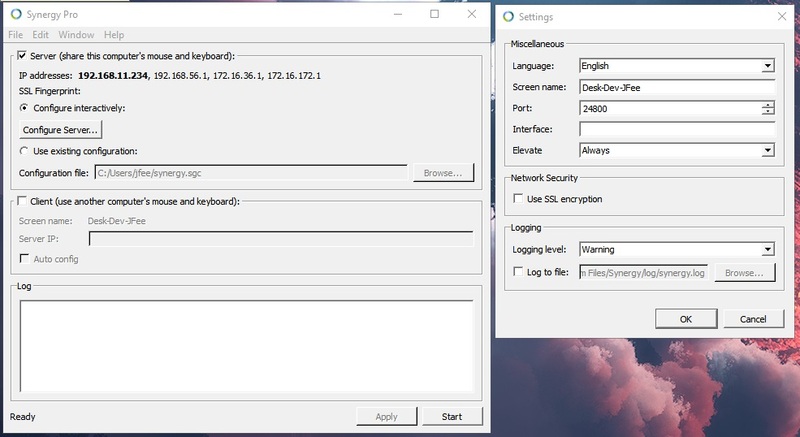 When I use synergy at home (my home PC is a generic PC running Windows 10 pro same version 64bit) connected to the same client (my laptop M6300) it does not seem to happen (or at least not that i can recall). my home machine does not have Visual Studio installed and i do not use SQL management studio at home either (access all that remote through teamviewer to my work PC). My client PC generally only has Chrome (2 instances with several tabs each), Outlook (don't hate me it is old and i mean to move off it), and sometime Firefox open - it is an 8 year old laptop so don't so much with it. Same issue here. I was using 1.8.8, and am now using 1.9rc3 (Issue occurs on both). I also have a Windows 10 Server and run Visual Studio. My client is macOS 10.11.5. Any more information about this? Does support require more details? Hi @James Fee. Can you try setting the elevation on both machines to Always? no help, just had the click get lost on the client machine. move cursor back to server, click on something, move back to client and click is working again. Elevate is "Always" on both the client and server. Let's try disabling taking foreground windows then. Sometimes, a reboot may be useful for this settings to take effect. well, i thought that might have been working but i just lost the click on the client. doesn't seem to happen as often as it was before but still happening. Have you tried to check services.msc to see if Synergy is running? Also, have you noticed if that happens after a reboot or a shutdown? No, you misunderstand. The mouse still moves around on the client and (since it is windows 10) when i hover over a program that is minimized or not in the foreground, it displays. things register rollovers and other mouse behaviours, it just will not left click on anything. I have to move the cursor back to the server, click on something in the server (desktop, browser, anything but Visual studio) and then i can move the mouse back to the client and the click is working. Logically, given the observable data, synergy/symless must be running on both the client and the server. And both machines have been rebooted since i made the last set of changes you suggested. I see @James Fee. This sounds like a firewall issue honestly. One Synergy user had the same scenario before and the culprit was a third party firewall that blocks it. Anyways, this could be a different scenario but ,we might as well check that first. That being said, can you verify if you have any third party firewall installed on either of your machines? If so, can you try switching that off temporarily and check if you still loose the your left click? Both machines are running stock windows defender and windows firewall. 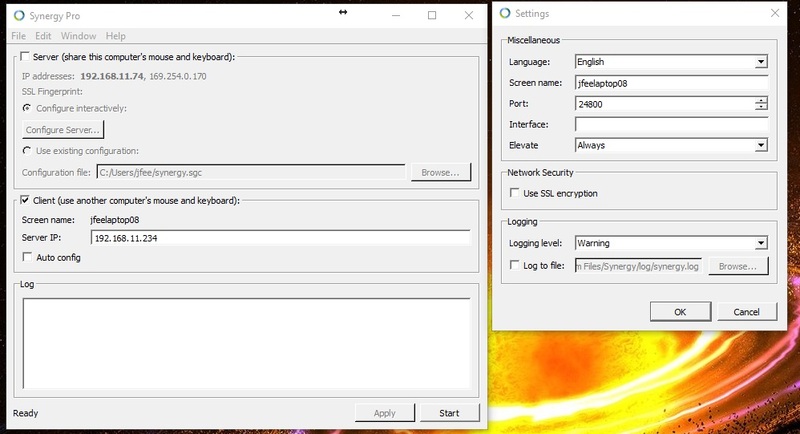 Can you check "Allow an app through Windows Firewall" if Synergy is set to be allowed on it? You can just press the Windows button and type "allow," it should give you that search option. on my server machine at work, Synergy is allowed through the firewall for Domain, private, and public and is not part of group policy. on the client (which is not on the domain but on the same network), synergy is allowed through the firewall on private and public. Firewall should not be an issue. I also do not recall this ever being a problem a year ago on an older version. I should also mention that when the click stops working the keyboard does not. i am typing this message on the client machine where the click has stopped working and i used keyboard commands to switch to this browser tab and navigate to the add comment box. Also to be clear right and left click do not work (no clicking at all), but mouse cursor still moves just fine. Can you post a screenshot of both machine's Synergy interface and the Server Configuration interface on your server machine. Hmmm... I suspect it could be one program opened on that machine that might be preventing the clicks. Please set both machine's logging level to "Debug1" and send us the logs it generates after experiencing the same thing. I will do this but the only setup i have that exhibits this behavior is at work and i will not be back there until Monday. It is also the only setup where the server has Visual Studio (2010/2012) and Microsoft SQL Server Management studio installed and usually running. I have mentioned that i believe this is tied to Visual Studio (2010 is the one i use the most). My home server does not have those installed and when i work from home, i remote into my machine at work but it is then not the Synergy server, my home box still is. As i have also mentioned, the loss of click does not happen on my home setup only my work one. I have turned on debug 1 on my home box as well.